On the backs of Masahiro Tanaka, Luis Severino, CC Sabathia, and a lockdown bullpen, the Yankees mounted an unforgettable comeback. Dethroning the reigning American League champions, an Indians team that won an MLB record 22 straight games—the Yankees pulled off the impossible. Reveling in pressure situations this postseason, the team has now won 4 straight elimination games. Overcoming the challenge of taking down the mighty Cleveland Indians, a team that won 102 games this season, was one thing. Now, the Yankees must combat a different kind of animal, the 101 win Astros. In a 7-game set that begins tonight at 8PM in Houston, Mashairo Tanaka is set to duel with 2015 Cy Young award winner Dallas Keuchel. Defeating the high-powered Astros and punching a ticket to the World Series for the first time since 2009 will be no easy task. Here’s what needs to happen to get it done. It’s really no secret, the Astros lineup is the best in baseball. They lead the league in batting average (.283), OPS (.827), runs (896), hits per game (9.82), total bases per game (16.66), and Ks per game (6.73). A lineup featuring 5 guys with 20+HR and 80+RBI, it’s hard to find a loose end anywhere in the order. In a 3-1 series victory over the Red Sox, MVP candidate Jose Altuve absolutely exploded. Going 8 for 15 (.533) with 3HRs and 5 runs scored, he was a thorn in the Red Sox side all four games. They also let Alex Bregman and Carlos Correa have 2HRs a piece, while George Springer also went deep and hit .412 in the series. Their silent killer in the 7-hole, Yuli Gurriel, quietly hit .299 this season and tortured the Sox. Hitting at a .529 clip in the Division Series, the 33-year-old had 18HR and 75RBI in 2017. For the Yankees, the Indians bats that they expected to do damage went ice cold. The only player that really produced was Jay Bruce, who hit .278 with two big homers early on in the series. Yankee pitching was able to keep Francisco Lindor, Jason Kipnis, Jose Ramirez, Edwin Encarnacion, and Michael Brantley to averages of .182 or under. Credit the phenomenal pitching performances from the rotation and bullpen alike, but now they’ll try to contain an even better lineup in a 7-game set. Combining for a meager stat line of 5 for 43 (.116) with 2HR (both Sanchez), 5 RBI and 26Ks, it’s a miracle they made it out of the Divisional round with such little output from their two biggest sluggers. Judge’s 16Ks is the most ever in a postseason series, and keep in mind this was only a 5-game set. To provide some perspective, Judge had more Ks this series than Tony Gwynn did the entire 1995 season (15). Set to face Dallas Keuchel in Game 1 and Justin Verlander in Game 2, these aren’t the pitchers any hitter wants to face to get their stroke back. Judge and Sanchez are both 0 for 3 with a K against Keuchel, and neither has faced Verlander yet. Since Verlander has been in Houston, in 5 starts he boasts a 1.06ERA in 34IP with 17H and 43K. As for Keuchel, he has owned the Yanks in his career thus far: 44.2IP, 30H, 7ER, 45K, 1.41ERA. The Yankee with the most success off Keuchel? Chase Headley, who is 6 for 22 (.273) with a 2B, HR, and 4RBI. The next best average against him would be Didi Gregorious, who is 2 for 10 (.200). Ranked 17th in the MLB, the Astro’s clear weak point is their bullpen that collectively posted a 4.27ERA this season. By and large, Houston’s bullpen has been unimpressive. Even against the Red Sox, guys like Chris Devenski, Brad Peacock, and closer Ken Giles got hit around. In fact, the only guy to deliver at least two scoreless innings was Luke Gregerson, who posted a 4.57ERA in 61 innings of work this year. On the other hand, the Yankee pen has been unhittable. 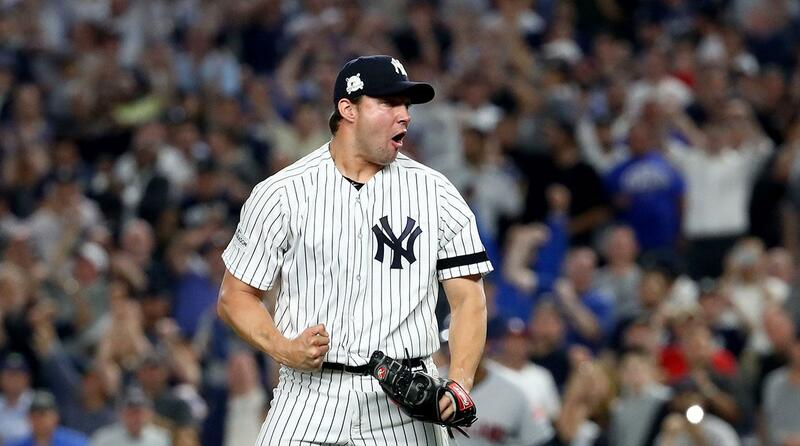 Essentially winning them the wild card game, the three-headed monster of Tommy Kahnle, David Robertson and Aroldis Chapman has combined for an insane stat line this postseason: 19.2IP, 9H, 1ER, 29K, 0.47ERA. What is needed for a trip back to the Fall Classic? To take down the Houston Astros and advance to the World Series, it begins with the Yankees rotation. Tanaka is scheduled for Game 1, then it’s Severino, CC and Gray. None of them can have blow-up starts allowing 5 or more. If the Yankees are able to steal a game in Houston against Keuchel or Verlander, it’ll be because the lineup knocked them out of the game and they were able to tack onto the lead against Houston’s weak middle relief. Stealing a game in Houston is crucial, as Houston would likely throw Charlie Morton in Game 3 in the Bronx, a guy who the Yankees are hitting .327 against with a .994OPS. Lance McCullers, a potential Game 4 starter, has struggled of late. Posting a 6.92ERA in 3 September starts, the 24-year-old didn’t go more than 3 innings against Boston after giving up 2ER in the Astro’s only loss that series. This Yankee team has outdone itself in every facet of the game this postseason. From clutch hitting, to gritty starting pitching performances, and a lights-out bullpen—they are showing flashes of the 90s teams. While much remains to be accomplished before those comparisons are whispered—all of baseball knows this team driven, capable, and perhaps the scariest part—just starting.